The issues that brought about the Civil War in the United States were long suffering events that originate even as the nation was coming into being. The matters of States’ rights and slavery filled the land. Who should hold more authority, the central government that would ultimately exist in Washington, D.C., or should each state have the authority over their functions? Should slavery be allowed throughout the nation or just in areas where it already permeated? Could a government dictate what a person could do with their property, in this situation, enslaved human beings? These two concerns were already controversial in the days prior to Missouri becoming a state. They played a role in whether or not Missouri could even be a state. The Missouri Compromise provided a somewhat “happy” middle ground with granting territories to become new “slave” states as long as another territory was being admitted at the same time as a “free” state. It allowed Missouri to become the 24th state, a “slave” state, in 1821 with the admittance of Maine as the 23rd state, a “free” state in 1820. This would be the only instance of enacting the Missouri Compromise, as other legalities would come into play in subsequent years. Still, the concept of whether new states could practice the act of slavery continued to be felt. When Kansas and Nebraska entertained statehood, more conflict arose with slavery. Many of the settlers to Missouri had come from slaveholding states, such as Kentucky, Tennessee, North Carolina, and Virginia. They brought their possessions with them across the Mississippi, and one portion of those possessions was slaves. Many of these slaveholders settled in land that would be part of Northern Missouri, especially around the Missouri River. The land gave an abundance of agricultural opportunities and the slave possessions of the settlers held a vital importance to the growth of the agriculture in the area. Most Missourians who owned slaves owned less than a handful, maybe a small family unit who worked right along with their owners. The slave population grew as more people arrived in the state. The 10,222 slaves in Missouri in 1820 became nearly 115,000 in 1860. That growth was not proportionate with the increases in white population, however. Slaves made up 15 percent of the total population in 1820 yet only 9.7 percent in 1860. The start of the Civil War found Missouri as the second smallest slaveholding state with Delaware only having less. Every existing Missouri county at the time had some slaves. There were 6,374 in Lafayette county in 1860 with Howard county not far behind. Even in the counties with abundance of slaves, most people did not own that many slaves. Jabez Smith of Jackson County was seen as the one Missourian with the most slaves and he only owned 244 in 1850. Smith wasn’t atypical of a large Missouri slaveholding, large possessions in the state were ten to fifty slaves. They were used in the production of hemp for rope and in the cultivation of tobacco. Some were used in the process of “hiring out,” working for neighbors. This was especially common in the large communities, such as St. Louis. Some slaves held valuable skills and were in high demand. That would also increase their value in the event of being sold. Young male slaves brought $450 to $500 in 1830. The same slave would be valued at $1,300 before this time was ended. Women brought less and the less valuable were the elderly and young children. The selling of slaves was probably one of the worst elements of the slave trade. A slave who caused problems for their owner would often times be shipped to market to be auctioned off to the highest bidder. Those slaves throughout Missouri would usually be sent to St. Louis for sale or sent downriver to be sold. They would be groomed much in the same way one would prepare a horse for sale. Their hair would be darkened to eliminate any gray and their skin would be slicked to appear strong and virile. 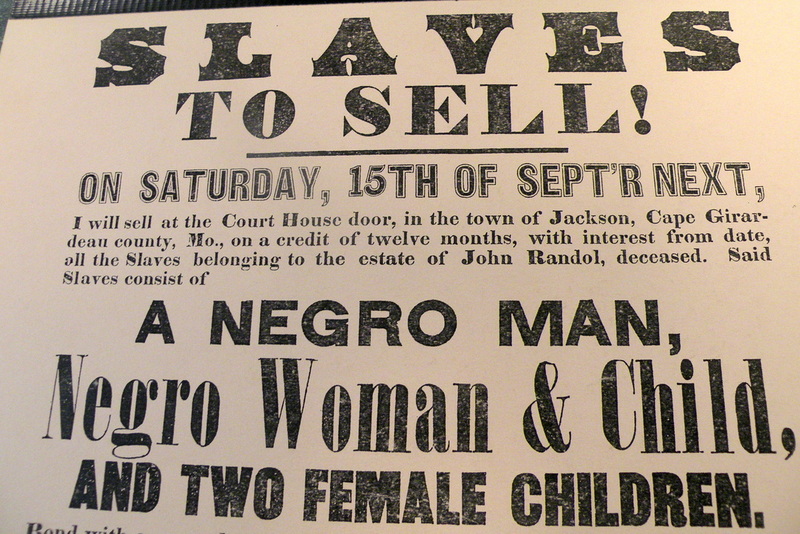 These slaves for sale were no different than a head of livestock placed on the auction block. Slavery was deeply ingrained in Missouri for many years by the time the first conflicts in the Civil War occurred. It was an economic and social component of Missouri life. Many saw it as an integral part of the way things worked in this state. It would be integral to the attitudes and actions of Missourians as the War Between the States beckoned on our nation.